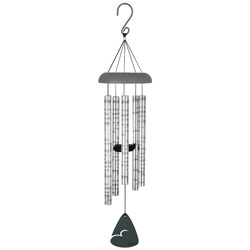 45.00 is for the wind chime. 65.00 includes a 48" wrought iron stand. 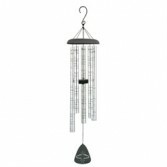 (The stand is pictured on our Gift Items page) Each Chime Tube Reads: Friends share memories of the past and joys of the present. They are someone you can always count on to make our world a better and happier place. Never Ending Love, Together we are one, United in God's eyes. A love blessed. 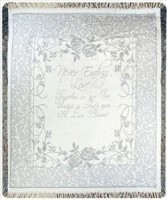 Presented to the happy couple folded and wrapped with a bow. HEAVEN'S TEARS - IF TEARS COULD BUILD A STAIRWAY..
45.00 is for the wind chime. 95.00 includes a 48" wrought iron stand. (The stand is pictured on our Gift Items page) Each Chime Tube Reads: If tears could build a stairway, and Memories a lane, I'd walk right up to Heaven and bring you back again. My heart still aches with sadness, and secret tears still flow. What it meant to love you no one can ever know. But now I know you want me to mourn for you no more; to remember all the happy times, life still has much in store. Since you'll never be forgotten, I pledge to you today – a hallowed place within my heart is where you'll always stay. Know someone who has lost their cherished furry friend? We have these for when the words "I'm sorry" just don't convey enough. Just let us know in special instructions which one you would like. It will be wrapped with a bow and delivered to your recipient.